Hey there guys! 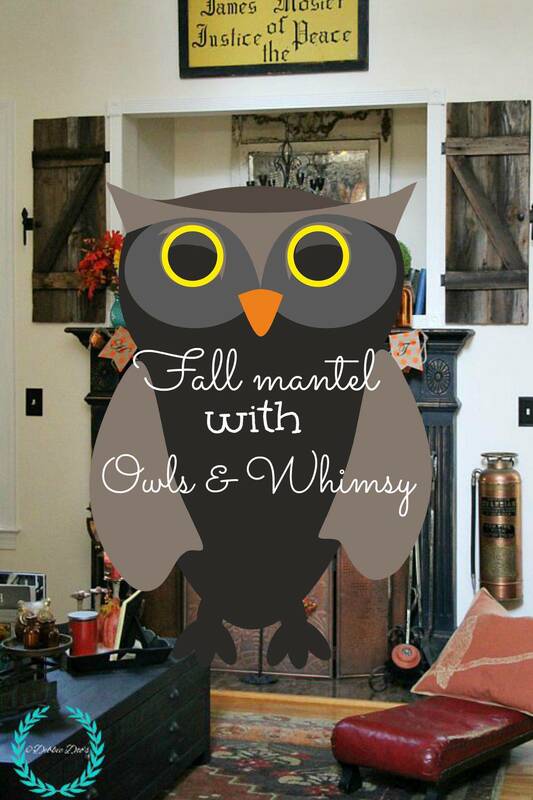 I finally got around to finishing our Fall mantel with owls and a tad of whimsy. Remember my dress rehearsal post that I shared the polka-dot burlap banner? Well, I played around with the mantel until I finally achieved the look I was going for. It’s always a struggle for me to decorate the mantel. It’s so not traditional and it’s hard to decorate with that open nook. I will tell you though, since saying goodbye to our yellow toned walls, it has made it a whole lot easier. I really love the copper owl swag I found at Home goods. It also came in silver. However, the copper spoke more fallish to me. The best DIY in our living room to date is painting the fireplace surround. You can find how to paint your fireplace surround HERE. It really makes our decor just POP now. It’s funny, I seem to get on a new theme each year. Last year our mantel was decorated more with sunflowers. Which you know I love those too. But this year it was all about the owl. This cute wreath I actually found at Rite-Aid. It was marked 50% off. I wound up paying $10.00 for him. I left my turquoise glass vase owl up from my summer mantel and added an arrangement of sunflowers to that. That owl came from Walmart. I really loved the mercury pumpkin I found at Home goods. It was cute and I already had the greenery ball that I just sat on top of it. I could add flowers, or sticks for next year’s look. I am always thinking ahead. I truly LOVE this time of year. Something about it just brings out a spark in me. I find more comfort and joy in decorating this time of year. I have always felt our home to be more suited for the fall season. Cheers to fall my friends! If you are new here, glad you stopped by. I would love to see you back again. Pin it and find yourself some owls to decorate with this fall season. 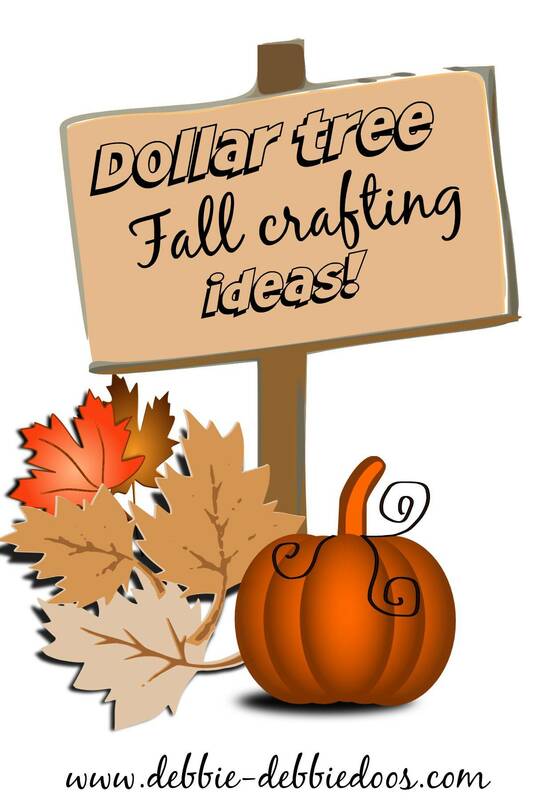 Love it, Debbie … that owl garland is too cute, and if I spy one at our HG, it “might” have to come home with me! You’re not fooling anyone when you say you have trouble decorating mantels … they always look as though you do it effortlessly, adding lots of textures, character and whimsy along the way! You are too sweet Becca! But I do struggle. It is not effortlessly on the mantel lol! 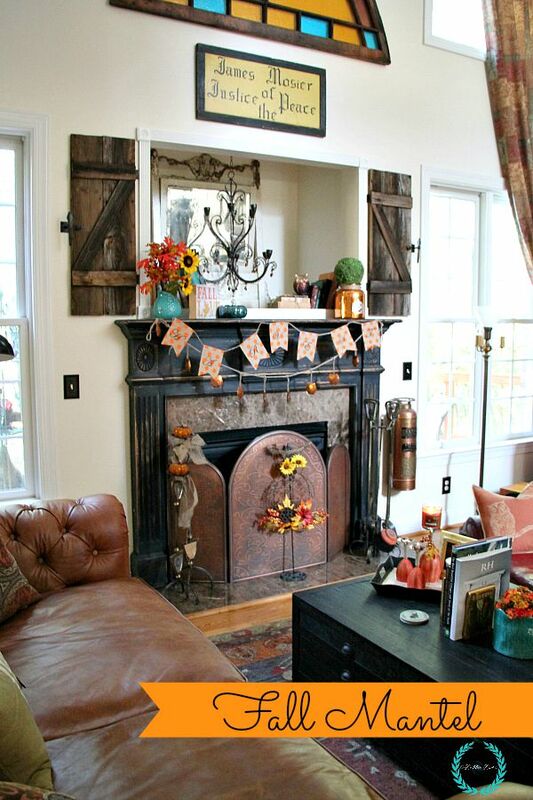 The mantle looks awesome love it those cute little copper owls are adorable and the little Wreath is so cute ? I missed it a lot too when we lived in Florida. I am a 4 seasons gal for sure. Your mantel looks great, Debbie! I love seeing it – I think your painting it black was one of the best things ever. 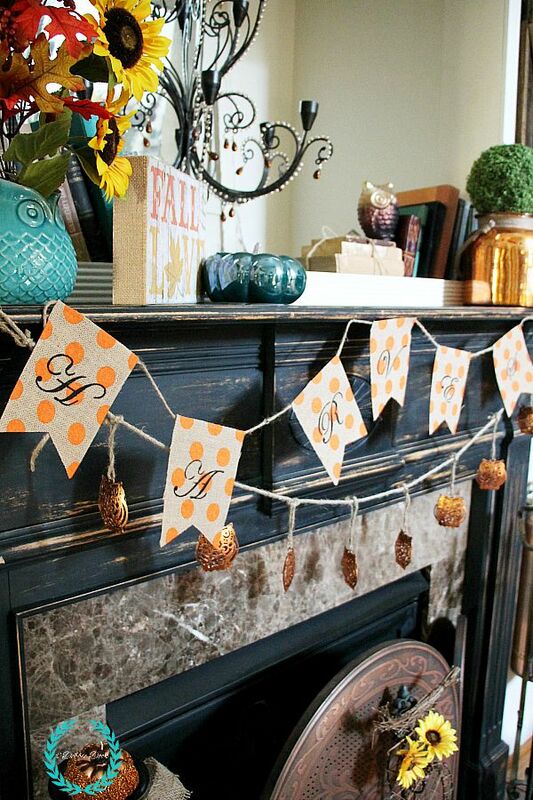 I like how you’ve decorated your mantel so it is not “in your face” Fall. I’m not quite ready to put any Fall out yet. It’s been way too humid here! I agree! I really love the painted FP too. It makes such a difference in decorating now. 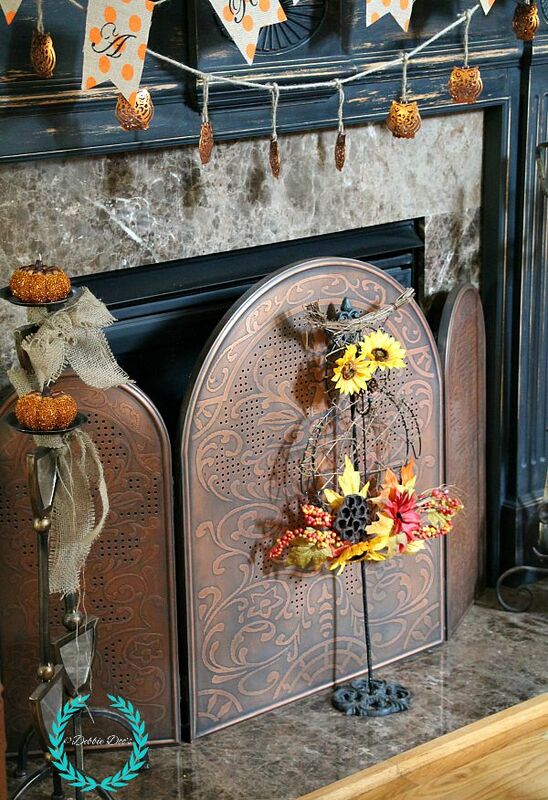 Your Fall mantel looks so festive Debbie! I love the owls. They are really cute. I love owls too! Thanks Pam. Oh Debbie how adorable! 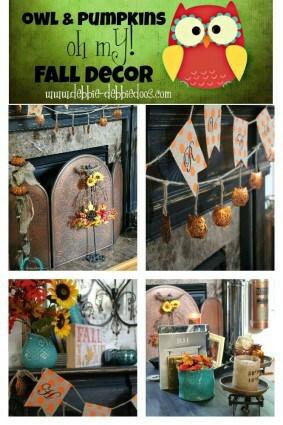 I love all of the detail you have added to your fall mantel. Just candy for the eyes! 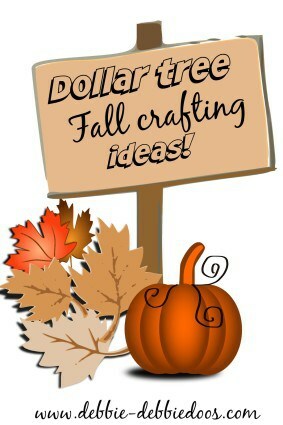 Love the fall…my favorite season! Thanks Barbara! I know I am a tad early, but I just couldn’t help myself! LOVE it! As always, it’s inspiring me. Now if we could have a temperature less than 90 degrees and less humidity, too, I may do something with that inspiration. 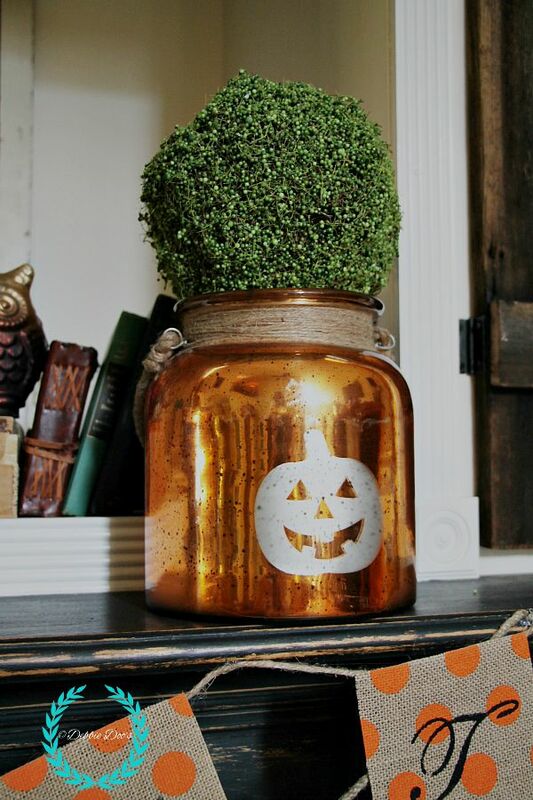 I love the teal glass pumpkin, but don’t see it mentioned. Where did you get it? Hobby lobbY around 5-6 years ago. Well, I have to say it makes me want to have a mantel in my house! We have no fireplace and currently are jam-packed with 6 adults living in our rather small split-level house. Hopefully soon my daughter and son-in-law will be able to move to a home of their own (being college graduates doesn’t always guarantee great jobs!) =( But our home has laughter, closeness, and forces us to be creative with our storage solutions! Love the owls and hope I can find something like this for my owl-loving middle daughter! Thanks for all of your creative ideas. When I have more room and a little more free time, I will have to try some of your creative ideas. Great Shery! Best of luck to the College grads. You are so right though, it’s a little scary. They spend all that money and then struggle finding a job. UGH. Your home does sound fun though! 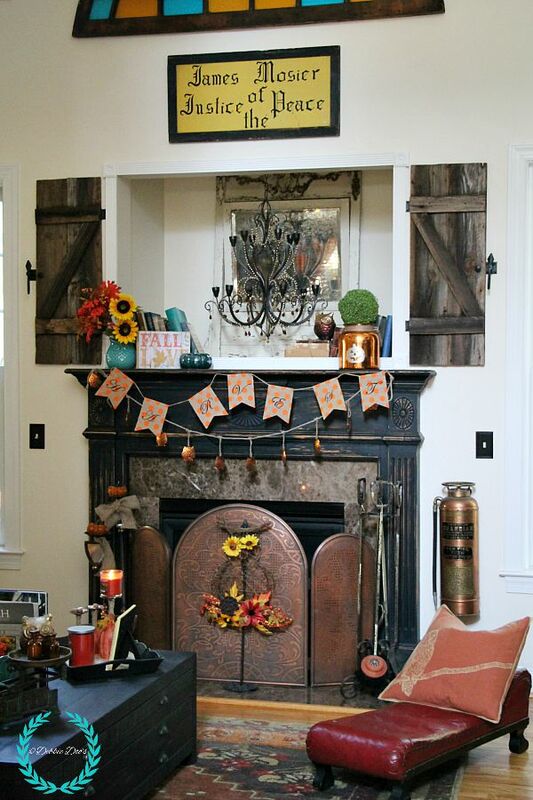 You can always just put up a large tin or wood shelf and pretend that is your mantel. There are a lot of creative ways to fake it. It looks fantastic Debbie and Im an owl lover too. Im glad they made a come back from the early 70’s go around. Your mantle is beautiful but I would expect nothing less from you. I look forward to Fall because I am not melting when I try to do something around the house. It is so stinking humid in Connecticut as I type this that you truly don’t want to do anything inside or out. I have a whole list of things I will get down when it cools down. Thanks for the ideas and I am glad to see you still have the Justice of the Peace sign above your mantle. Oh yes Patty, that will stay. We love it:) Thanks! Good job Debbie, really like the Fall decor; very cozy & homey. Great Job girl!! 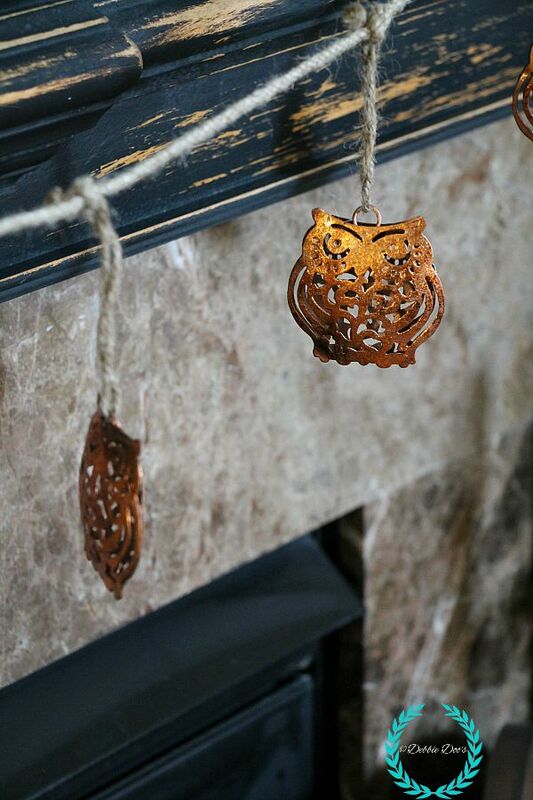 I adore the owl-theme you have going, Debbie, and the copper owl swag is just too cute! 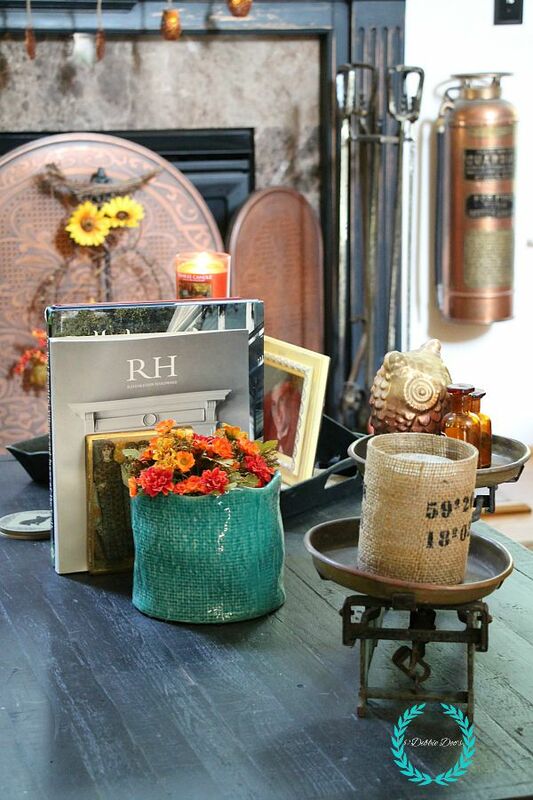 I love seeing the rich colors of Fall in homes, and I’m totally about those good earthy colors, too. 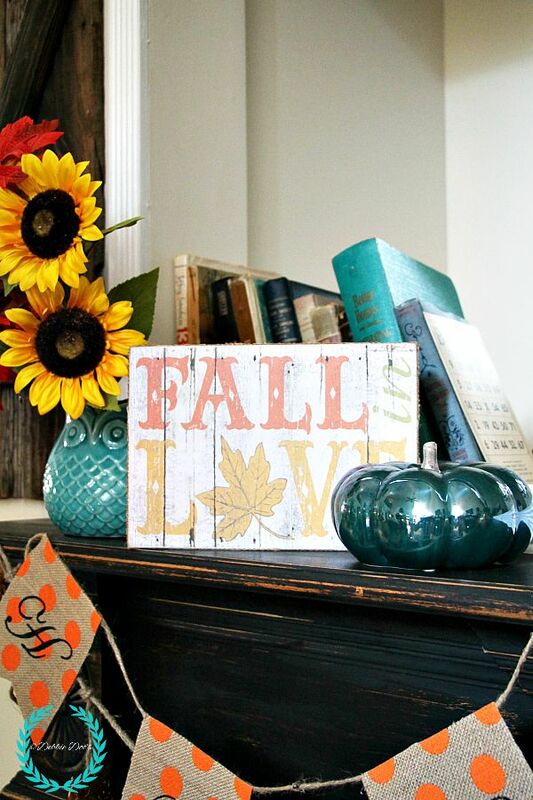 Even though we don’t actually get a season of Fall (well, maybe around Thanksgiving), I love to bring those colors into our home however I can. Sometimes I have to lower the temp on the air-conditioner in order to really get that Faux Fall Feeling……lol! Super cute and I love those owls!